It’s important for every merchant to know his customers' liking or disliking his products or services. 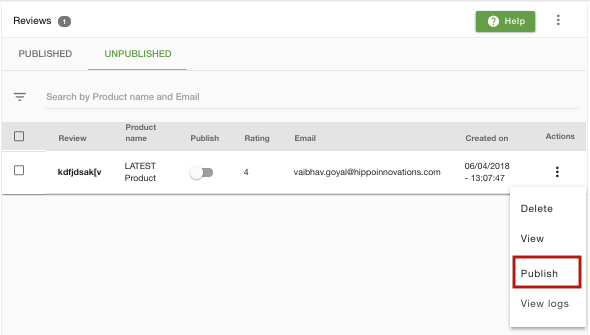 For this purpose, StoreHippo themes provide a Review/Comment box on every product page so that customers can share their experience of using the particular product or services. You can enable the product reviews in Settings > General Settings section in StoreHippo Admin Panel. Select the Auto Publish Reviews checkbox. When you select the checkbox, the reviews will be published automatically on your store as soon as customers comment in the review box. When a customer enters a feedback on your store's products or services, you have the liberty to decide whether you want to publish it for general viewing or you want to publish each comment manually yourself after reviewing and considering the provided feedback. 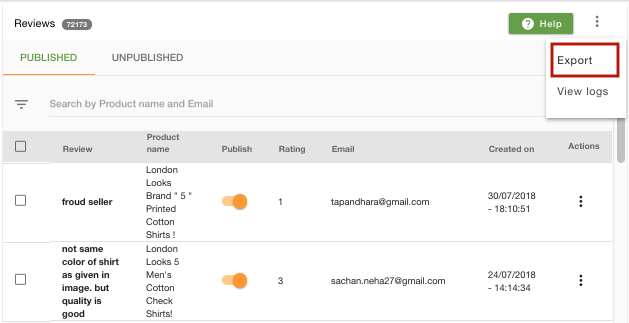 You can manage the product reviews in Products > Reviews section in StoreHippo Admin Panel. You can manually publish a review in the Unpublished tab by clicking on the publish option in the drop-down menu. Publish the review will to make a comment or review visible to all. Clicking on delete button against the review from the drop-down will delete the review. You can view the details of the review by clicking on the View in the drop-down. Here, you can view the general description of the review. You can also view the history and image of review if provided by the customer. Choosing the unpublish option will hide review from the front end and it will be listed under the unpublished tab of reviews. When you click on Unpublish option from the drop-down against a review, it gets listed under the unpublished tab. Also, the review gets hidden from the storefront. Use the search option to quickly find your reviews. 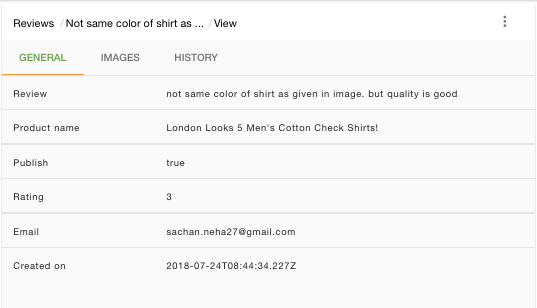 You can search a review either by product name or by email id with which the review has been posted. You can also use advanced filters to filter out the reviews. You can export all or specific reviews in a CSV file by using export command. The reviews can be exported the same as exporting products.